Wayne Gretzky holds dozens of NHL records, but he never was a candidate for the mark currently held by Alan May. The former enforcer is the only player in NHL history to be involved in four of the 427 trade-deadline deals since 1980. May twice was dealt at the deadline in back-to-back years -- in 1988 (Boston to Edmonton) and '89 (Edmonton to Los Angeles), and again in 1994 (Washington to Dallas) and '95 (Dallas to Calgary). Four other players have been dealt three times at the deadline, the most notable being Hall of Famer Mike Gartner, who was swapped at the deadline three times in a five-year span -- he went from Washington to Minnesota in 1989, from Minnesota to the New York Rangers a year later, and from the Rangers to Toronto in 1994. Among active players, no one has been dealt at the deadline more than twice. Nine current players have been involved in a pair of deadline deals, most notably Phoenix defenseman Derek Morris, who's been dealt in each of the last two years -- by Phoenix to Boston in 2009 and from the Bruins back to the Coyotes last season. Currency of the realm -- Teams looking toward the future understandably want high draft picks when they make trades at the deadline. But getting first-round picks is easier said than done. 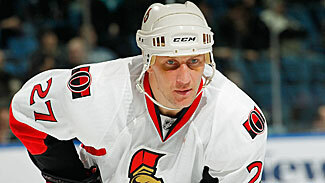 The Ottawa Senators dealt Alex Kovalev to the Pittsburgh Penguins for a conditional pick. Looking for instant gratification -- Every GM who makes a deal Monday will be hoping for the next Lee Stempniak or Peter Mueller. The Phoenix Coyotes landed Stempniak from the Maple Leafs at trade deadline last season after he'd struggled to score in Toronto. All Stempniak did was score 14 goals in his 18 games with the Coyotes, the most by any player acquired at the deadline since 1980. The Coyotes sent Mueller to Colorado for Wojtek Wolski at last season's deadline in perhaps the best of the great "helps both teams" deadline deals of all time. Mueller, who had struggled all season with Phoenix, put up 20 points in 15 games with his new team, the most ever by a player dealt at the deadline. Wolski, who similarly had struggled with Colorado, rediscovered his scoring touch with 18 points in 18 games. Not coincidentally, both teams got hot in the final weeks of the season and made the playoffs. Though he was a point short of matching Mueller's total, Robert Reichel's 19 points in 12 games after being acquired by the Islanders from Calgary in 1997 arguably could have been the best of all time. It's the second-highest total ever -- and Reichel did it in just 26 days, 14 days less than the current setup. Devils delight -- Six weeks ago, it looked like New Jersey would be a big seller at the trade deadline. New Jersey was just 10-29-2 at the halfway point of the season, last in the overall standings and 27 points out of eighth place. The Devils had the fourth-worst record of any team at the halfway point of the season since the 82-game schedule was adopted in 1995-96. None of those teams won more than 12 games in the second half of the season, a total the Devils had exceeded just 16 games into their second half. New Jersey now is on track to threaten the 1995-96 Detroit Red Wings for the best second half under the current format. The '95-96 Wings were 33-4-4 for 70 points in the pre-shootout era; the Devils' 16-1-2 (34 points) through 19 second-half games (entering Friday's visit to Tampa Bay) is a pace that would give them 73. That would give the Devils 95 for the season, likely more than enough to give them a historic playoff berth. Under the current playoff format adopted prior to the 1993-94 season, no team has overcome a deficit of more than 12 points to make a playoff berth -- the Islanders did it that season. Since the adoption of the shootout in 2005, the biggest deficit overcome by a team to make the playoffs is 11 points by San Jose in 2005-06 and by St. Louis three years later. One reason is defense -- the Devils allowed 3.12 goals per game in the first half; they've pared that number to 1.61 thus far in the second half -- aided by 1-0 shutout victories against the Rangers and Stars in the past three games. Another is the revival of Ilya Kovalchuk, whose 21 points in the last 19 games match his total for the entire first half. Four of his 10 second-half goals have been game-winners, including a pair in overtime. New Jersey's improvement has come entirely at even strength -- their special teams actually are slightly worse than they were in the first half. The Devils are plus-28 at even strength in the second half after going minus-52 in their first 41 games. Despite the big surge, they actually are minus-2 on special teams in the second half.